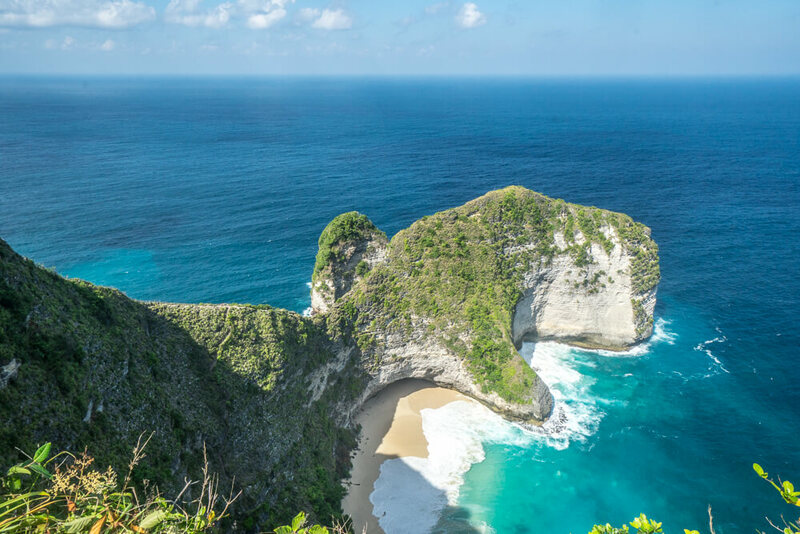 Home to the stunning Kelingking beach, the beautiful island of Nusa Penida is an increasingly popular place to visit as a day trip from Bali. 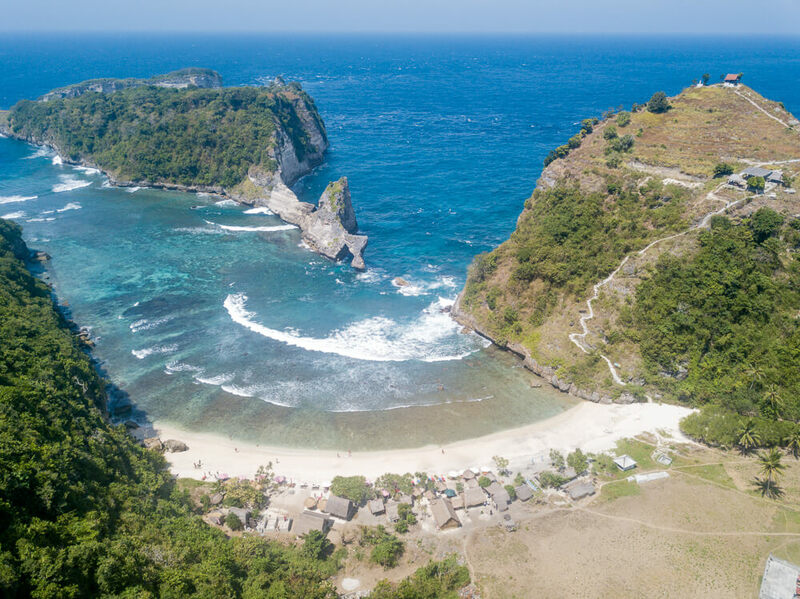 While Kelingking beach may be the most famous attraction on the island, Nusa Penida is also one of the best spots in Bali to go snorkelling and diving, with manta rays commonly spotted on tours visiting the aptly named Manta Point. 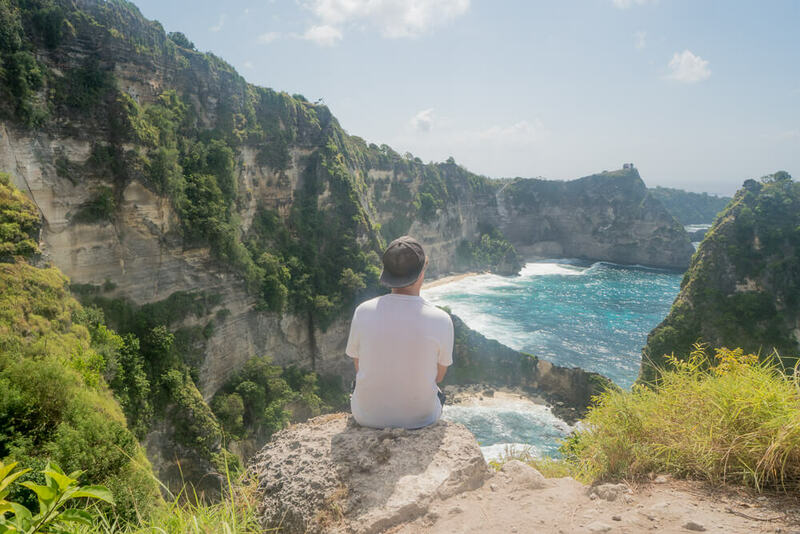 Although day tours to Nusa Penida from Bali are popular, it can be a better idea to spend at least a few days on the island to make sure you discover everything it has to offer. 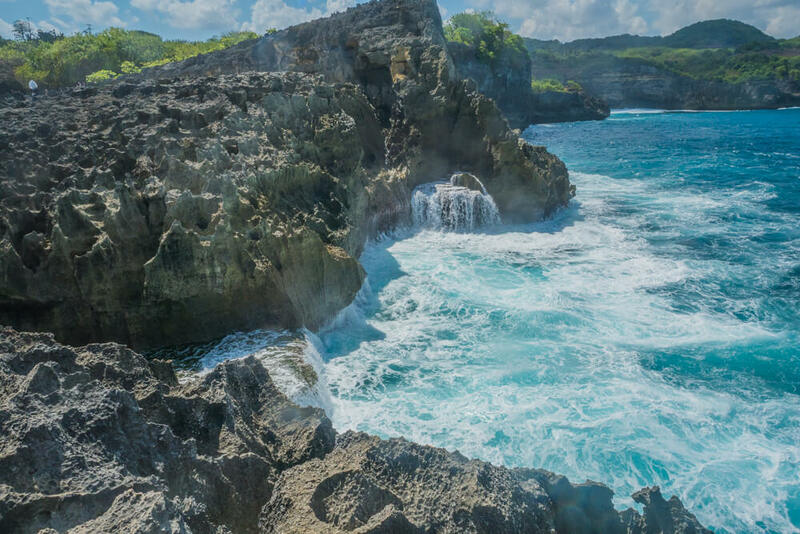 This way you can take your time to see the various points of interest, as well as visit the 2 smaller Nusa islands – Nusa Ceningan and Nusa Lembongan – if you wish. Whatever you do, make sure not to miss off a visit to Nusa Penida from your Bali itinerary. 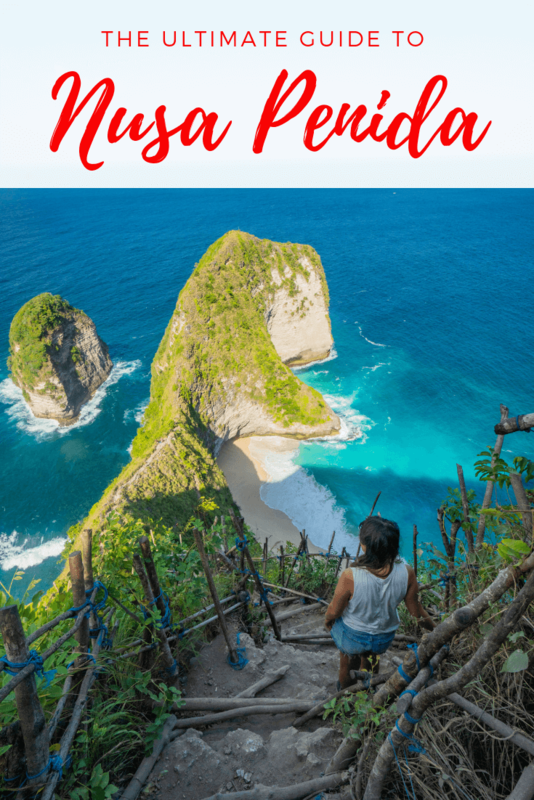 Find out everything you need to know before visiting this beautiful island with this Nusa Penida travel guide. Find out exactly what to take on your trip with our guide of what to pack for Bali! It covers our recommendations of what you need to have an incredible time! 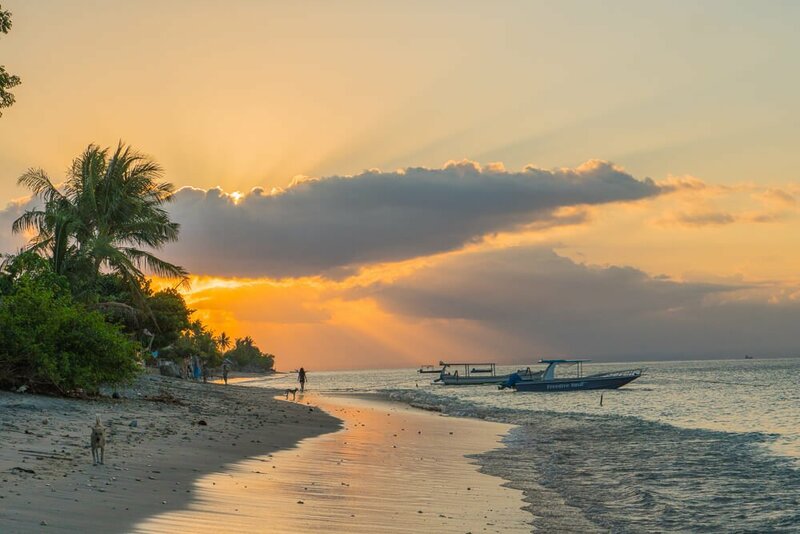 Whether you’re planning on getting to Nusa Penida from Ubud, Kuta or anywhere else in Bali, the first step of your journey is to get to Sanur. From Sanur to Nusa Penida you can either take the public boat or a ferry. The public boat from Sanur to Nusa Penida costs just 40,000 Rupiah, with a journey time of 90 minutes. These boats only depart once full so have no real set timetable. Alternatively you can catch a ferry from Sanur to Nusa Penida, which costs around 200,000 Rupiah one-way. Prices do vary depending on the company, so it’s worth asking around. There are a number of scheduled departures a day, but it’s worth booking in advance to make sure you have a ticket. Click here to check out the timetable and book a ferry from Sanur to Nusa Penida! If you need to get to Nusa Penida from Nusa Lembongan, the cheapest option is to catch the public boat. It costs 50,000 Rupiah one way and departs daily at 6am. If you’re just looking for a day trip to Nusa Penida from Nusa Lembongan then you may want to charter a boat for the day, which can be expensive. A better option is to take a ferry around 11am, which costs around 75,000 Rupiah. You can then spend a day or 2 exploring the island rather than paying more to rush it in one day. Click here to book a ferry from Nusa Lembongan to Nusa Penida! One of our tips for travelling Bali is to book your ferries in advance, so we recommend using the above links. It’s fairly common for ferries to sell out, especially during peak season, but by booking in advance you ensure you can travel on your desired dates! Getting around the island of Nusa Penida is possible by scooter/bike or by car. Renting a scooter is a much cheaper option and costs around 75,000 Rupiah per day. Despite being cheaper, we strongly recommend against driving a scooter on Nusa Penida as the roads are in extremely poor condition. Our driver informed us that even experienced drivers get into accidents when riding scooters on the island, as the bumpy and unpaved roads make it easy to lose balance. It really isn’t worth risking injury to save some money; especially as your travel insurance will be invalidated if you don’t have the proper license to ride a scooter/bike. Fortunately, new roads are being built in Nusa Penida. These roads are unlikely to be finished for a few years, but once they are it should be a lot safer to travel around by scooter/bike. To travel by car you’ll need to find a driver for a day tour of Nusa Penida. A great way to find a driver is to ask at your accommodation, as they should be able to point you in the right direction. If not, you should be able to find a phone number or email address online to contact a driver. Prices will vary depending on the driver, but we recommend negotiating, as they will often try to overcharge foreign tourists. We paid 600,000 Rupiah for a day trip round the east side of the island and 500,000 Rupiah for a day trip round the west side. Although it may not be obvious from looking at a map of Nusa Penida, it’s not really possible to see both sides of the island properly in one day as the roads make it hard to travel quickly between different attractions. Although travelling by car in Nusa Penida is a lot safer, it still can be a bumpy and uncomfortable ride due to the bad roads. Thankfully, it’s reassuring to know that your driver is used to driving in these conditions. If you book a private tour package to Nusa Penida from Bali then a driver should come as part of the price. This saves you the hassle of having to arrange it yourself, although generally these tours are just day trips. The dry season in Bali runs from April to September, and so is therefore the best time to visit Nusa Penida. Expect the island to be busier during these months, in particular between July and September due to the European summer holidays. If you plan to visit at this time we recommend booking accommodation as far in advance as possible. 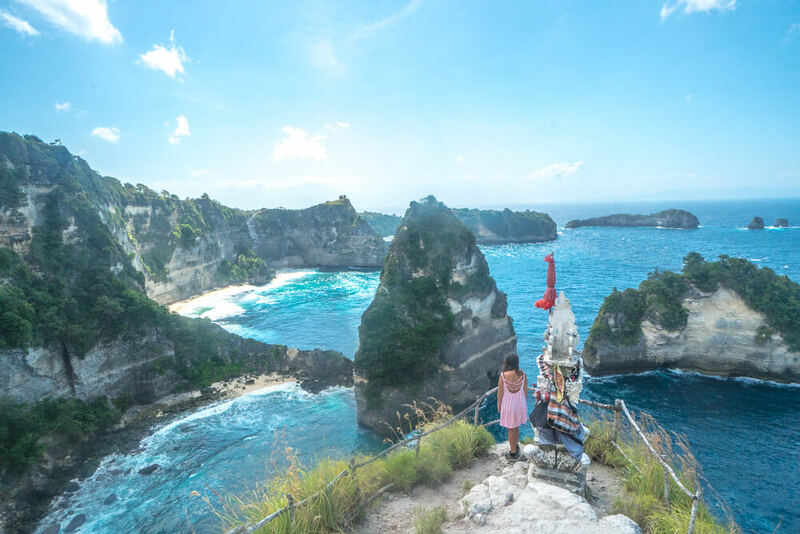 Although October to April is technically the rainy season for Nusa Penida and Bali, don’t let this put you off visiting as there are still plenty of nice days during these months. That being said, you should avoid visiting Nusa Penida and Bali between December and February, as these are the rainiest months. If you plan to go diving on your trip to Nusa Penida, the best time to visit is between July and October. At this time of year it’s possible to see the extremely rare Mola Mola (sunfish), making it a brilliant time to dive in the area! As you’d expect, most days are very warm on the island, especially during the dry season. We recommend booking accommodation with air con to make sure you can escape the heat! Kelingking beach – One spot you simply cannot miss off your Nusa Penida itinerary is the famous Kelingking beach. Surrounded by towering cliffs, this beautiful white sand beach is a truly stunning sight. Located in a small cove on the west side of the island, Kelingking beach backs onto cliffs that look remarkably like a roaring T-Rex. There are some brilliant vantage points to enjoy amazing views of the beach from, and if you’re lucky you may even spot manta rays and eagle rays swimming just off the shore! Unfortunately, the walk down to Kelingking beach is tough as the pathway consists of very steep steps made out of rocks and dirt. The bamboo railing that runs alongside the path is not particularly sturdy, so we advise to take your time and avoid putting too much weight on it. In total the walk down to the beach takes around 45 minutes. As the return journey is uphill, it’s substantially tougher and takes around an hour. The beach itself is beautiful, with white sand and lovely blue water to enjoy. Generally it won’t be too crowded, as most visitors to the beach don’t actually walk all the way down due to the steep path. If you decide to go down to the beach itself then be extremely careful when swimming. The current at Kelingking beach is extremely strong and can easily pull you under without warning. Unless you’re a very strong swimmer we’d advise to just enjoy the beach without going for a swim! To avoid tourists, we recommend visiting Kelingking beach either early in the morning or late afternoon. As it’s one of the main points of interest in Nusa Penida the viewpoints can get extremely busy. By arriving early in the morning or late afternoon you should be able to get better views and pictures without other tourists getting in the way! Although there is no entrance fee for visiting Kelingking beach, there is a parking fee of 10,000 Rupiah. 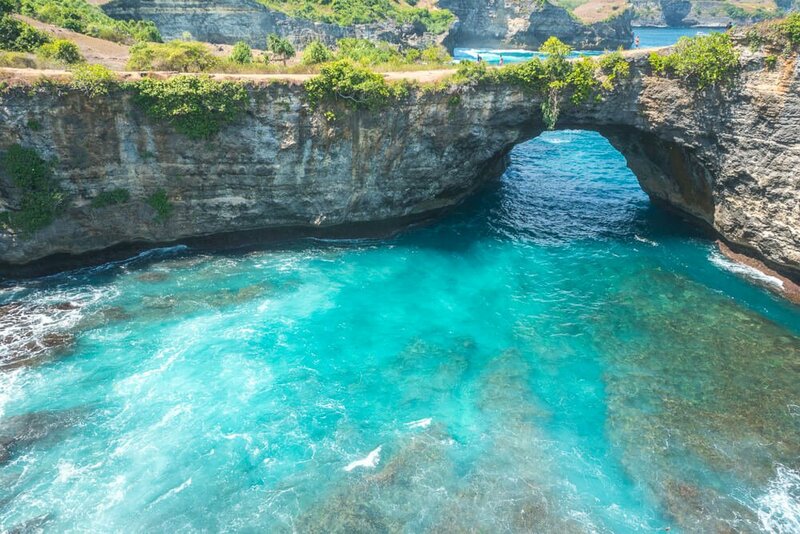 Angel’s Billabong – The natural infinity pool known as Angel’s Billabong is one of the most unique points of interest on Nusa Penida. 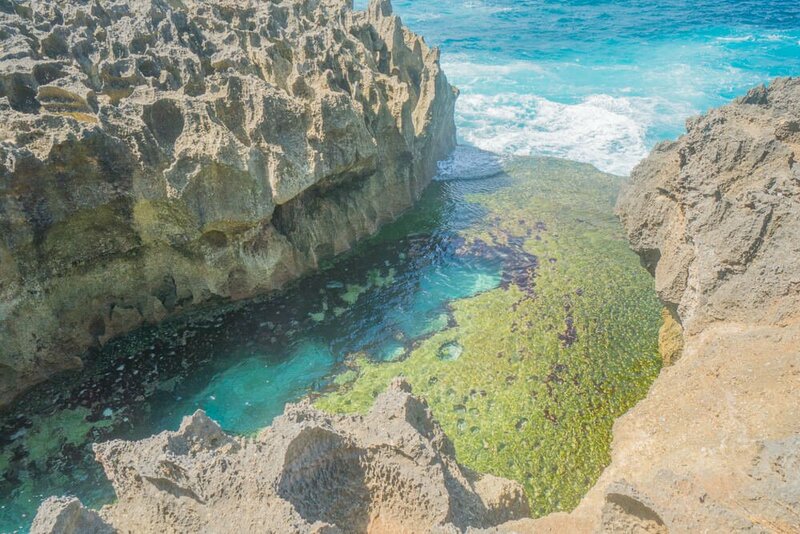 This lovely natural pool is lodged between two cliffs and is slightly elevated above the surrounding sea. The edge of the pool is also a cliff’s edge, which makes it nature’s version of the infinity pools often found in luxury hotels! At low tide it’s sometimes possible to swim in the pool at Angel’s Billabong, although it’s not particularly safe to do so as there have been a number of deaths. During high tide the waves crash against the cliffs, sending water powering into the pool. If you happen to be in the pool when this happens you can easily be thrown against rocks and dragged over the edge out to sea. In the interest of safety we don’t recommend swimming here, as it isn’t worth risking injury. Instead you can simply enjoy the view. The crashing waves at high tide are impressive as they catapult water forcefully into the pool. When the excess water leaves the pool it forms a temporary waterfall as it makes its way back into the sea. There is a 10,000 Rupiah parking fee, which is good value considering you can visit both Angel’s Billabong and Broken beach in one go! Crystal bay – If you’re looking for a beach in Nusa Penida that doesn’t involve a steep descent, then Crystal bay is perfect. Although, there are nicer beaches on Nusa Penida it’s still a pleasant place to soak up the sun and relax. It’s also a nice spot to do some snorkelling too! One of the best things about the beach at Crystal bay is that you won’t have to work up a sweat when you leave, as the car park is right next to the beach. Also located on the west side of the island, parking costs just 10,000 Rupiah. Broken beach –Another popular attraction on Nusa Penida is Broken beach. It gets its name from an archway in the cliffs that allows seawater to flow in and out of a small cove. There is no way down to swim at broken beach, but it’s still a lovely spot to see. It’s just a short walk from Angel’s Billabong so is well worth visiting if you’re nearby! Atuh beach – Atuh beach is the most popular beach on the east side of Nusa Penida. It’s possible to walk down to the beach from either side, although it’s much easier from the right side as there are stairs. The left side starts as more of a dirt path, similar to that at Kelingking beach, before you reach stairs which lead the rest of the way down. This lovely white sand beach is enclosed by cliffs and has beautiful clear blue water perfect for cooling off in. At sea there is an impressive arch rock formation, which you can swim out to and do some cliff jumping on your visit to Atuh beach. If you park at the right side of Atuh beach there is a small parking fee of 5,000 Rupiah and an entrance fee of 10,000 Rupiah. There is no parking fee or entrance fee at the left side, but you’ll have to navigate the steep unpaved path at the start. If you do visit from the left side, take your time at the start to avoid slipping and injuring yourself. Thousand Island viewpoint – Also found on the east side of the island is the beautiful Thousand Island viewpoint. 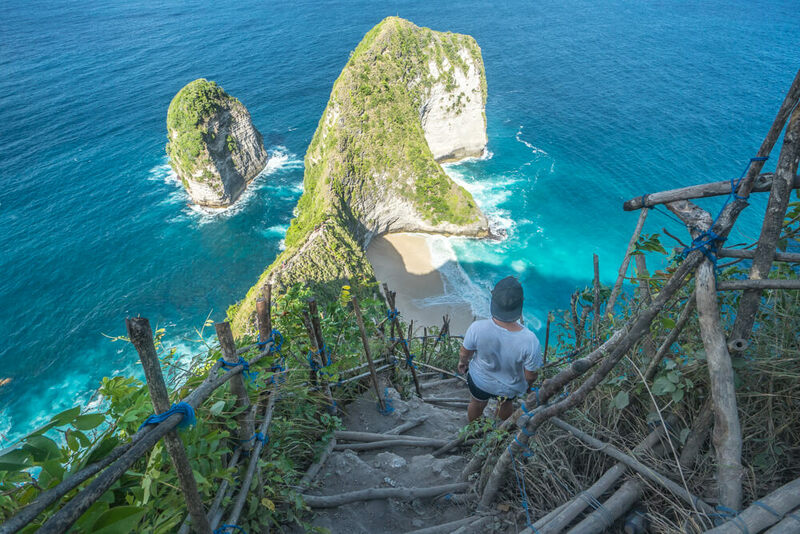 This spot offers incredible views of rock formations and cliffs along the coast of Nusa Penida. A steep trail leads from the car park down to the first viewpoint. There are a few vantage points in the area, so follow the trail round past the treehouses. It’s actually possible to stay in a treehouse at the Thousand Island Viewpoint on Nusa Penida, although the location is pretty remote! The name is slightly misleading as there are nowhere near a thousand islands to see, but it’s still a brilliant view regardless! Even if you take your time to enjoy the views from the different vantage points you shouldn’t need more than an hour here. The entrance fee at the Thousand Island viewpoint is 10,000 Rupiah per person. Snorkelling – Nusa Penida is one of the best places to go snorkelling in Bali. There are a number of snorkelling sites around the island and nearby, with some of the most popular being Manta Point, the underwater Buddha temple and Crystal bay. Snorkelling at Manta Point is one of the best things to do in Nusa Penida, as magnificent manta rays are often found in the area. The chance to see such majestic creatures up close is a real treat, and shouldn’t be missed! If you’re extremely lucky, you may even see the elusive Mola Mola (sunfish) on a snorkelling trip as they come to the surface to warm up. They are only seen in the area between July and October. There are plenty of places to snorkel in Nusa Penida that can be accessed from the shore, including from Ped Village, Crystal bay, Toyapakeh and Gamat bay. With some brilliant reefs to explore and a variety of marine life to enjoy, make sure to discover the underwater world around the island! The price of a snorkelling tour to see the manta rays in Nusa Penida varies depending on how many other spots you visit, but expect rates to start at around 150,000 Rupiah. Don’t be afraid to ask around and haggle to get the best price. The current can be quite strong so you’ll need to be a confident swimmer, but tours have around a 97% success rate in seeing manta rays. Your accommodation should be able to help arrange a snorkelling tour for you, but if not then ask some locals or at a restaurant and someone should be able to help out. Diving – Nusa Penida also offers some incredible diving opportunities, with a number of brilliant dive sites near to the island. Dives in the area are exciting thanks to the diverse marine life. 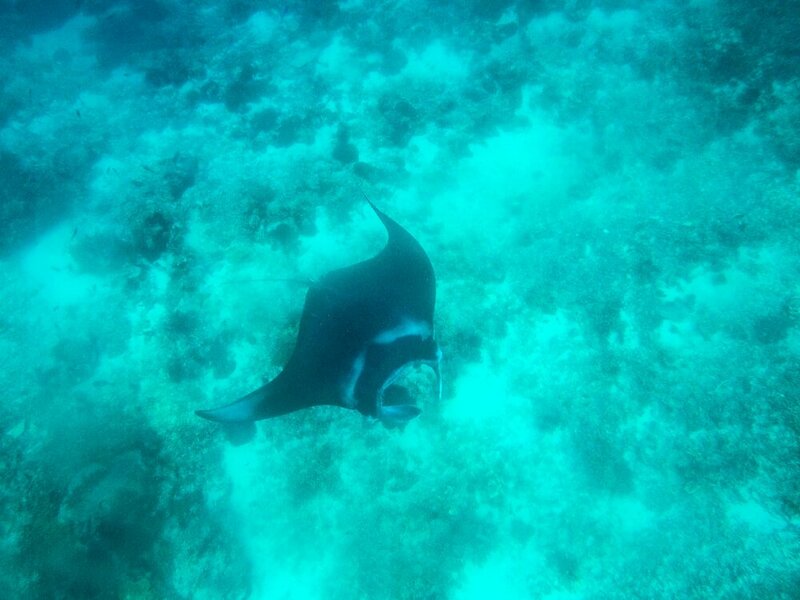 Diving with manta rays at Manta Point is an incredible experience, and should not be missed. If you’re visiting between July and October you may also be able to see Mola Mola’s on a dive – although you’ll need some luck! Click here for more information on diving and the dive sites in Nusa Penida! Ramwan Guest House is another great budget accommodation option in Nusa Penida. Located in Ped Village, the property is just a short walk from a number of restaurants – so there’s plenty of choice for dinner! There property does offer air conditioned rooms at a higher rate, but make sure to select the right room type when booking as it can get quite hot on the island. Rooms start from as little as $11 USD (165,000 Rupiah) per night, with breakfast included in the price. Click here to check out the latest rates at Ramwan Guest House! This lovely property in the north of Nusa Penida is a brilliant budget option. Thanks to the property’s beachfront location, you’ll have brilliant views of the towering Mount Agung volcano on Bali. A few restaurants are within walking distance of the property, so you won’t have to venture too far for meals. One of the best things about staying here is the friendly owners, who are more than happy to help with anything they can. Air conditioned rooms are available with prices starting at $22 USD (335,000 Rupiah) per night. Click here to see the latest prices at Coastal Inn for your trip! If you’re looking for reasonably priced accommodation with a pool in Nusa Penida, then the Govardhan Bungalow is a great option. It’s well worth the extra money to have a pool to cool off in, and rooms at the property are also fitted with air conditioning. Staff are extremely helpful and as part of your booking you’ll receive a free transfer to and from the ferry port. Rooms start at $35 USD (538,000 Rupiah) per night, with breakfast included in the price. Click here to see the latest deals at the Govardhan Bungalow! Another option with a pool is the WK Gamat Creative Resort. The property is conveniently located a short drive from the port, so it doesn’t take long to get there after arriving to the island. Staff at the property are incredibly friendly and helpful, which is extremely useful for planning tours! There is also a restaurant on site serving some good quality food, so you don’t have to venture out for dinner if you don’t feel like it. Rooms start at $42 USD (637,000 Rupiah) per night, with breakfast included in the price! Click here to see the latest prices at WK Gamat Creative Resort! Semabu Hills Hotel is one of the best places to stay in Nusa Penida. The property has a beautiful infinity pool with views over the ocean towards Mount Agung. If you want a property with beautiful views for sunrise and sunset in Nusa Penida, then this it it! Rooms at the property are luxurious and there’s a restaurant on site, which serves up good quality food. On top of this, staff are extremely helpful and will assist you in booking tours of the island. Prices start at $60 USD (844,000 Rupiah) per night, with breakfast included! Click here to take a look at the incredible Semabu Hills Hotel and book a room for your trip to Nusa Penida! Hotel Arsa Santhi is another brilliant option if you’re looking for comfortable hotels in Nusa Penida. The property is well located close to the port and has a lovely pool perfect for cooling off in! The staff are very friendly and will help with booking tours, which can save you a lot of time. There’s also a restaurant on site, which is ideal if you don’t feel like finding somewhere else to eat. Rooms start from $51 USD (780,000 Rupiah) per night, with breakfast included in the price. Click here to see the latest deals at Hotel Arsa Santhi! Full moon bungalows – The restaurant at Full moon bungalows has a menu with good variety. Although reviews online are pretty hit and miss, we ate there a few times and particularly enjoyed the barbecue chicken breast. Penida Colada – This small restaurant in Ped village is one of the best places for food and drinks in Nusa Penida. With a lovely beachfront location and 2 for 1 cocktails during happy hour, Penida Colada is a great spot to enjoy sunset. There isn’t really any nightlife on Nusa Penida, so heading here is your best option if you fancy a few drinks! Warung Mosawi – This warung near Crystal Bay serves good quality local food at very reasonable prices. It’s a great place to stop for lunch if you’re doing a tour around the west side of the island! 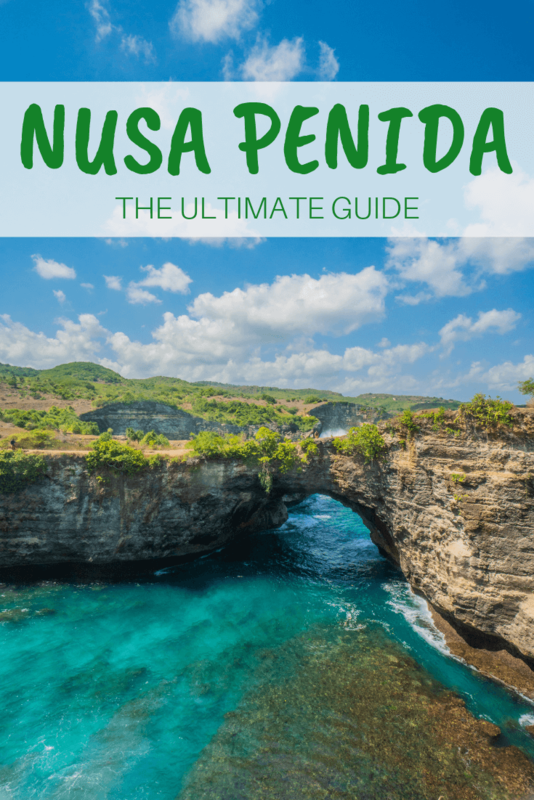 Like this Nusa Penida travel guide? Pin it!